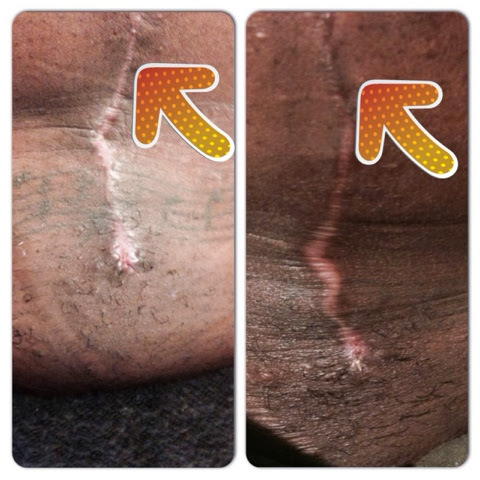 Former Fistula Fridays & Stomach Scar Sundays! So it’s time for stomach scar Sundays! Now what I’ve decided is that I’ll (try and) post progress of my arm on Fridays and my stomach on Sundays. Since Friday had already passed, I’ll post my fistula pic here in this post. Now I may not do it EVERY Friday/Sunday, but at the very least, any updates to be posted will be posted on those days. First, we’ll start off with my fistula side by side comparison. I think the healing is coming along nicely. I haven’t started wearing silicone strips on my arm yet, but I think it’s sufficiently healed enough to begin doing so, so I’ll be putting one on later. The arrow shows a spot just beside where I have a stitch sticking out. I’ll have to get that looked at soon and see if it can be removed somehow. I’ve picked at it a little a couple of times just because it’s there, but I’m also scared of yanking it or pulling it, lest I remove a “load baring” stitch and swimming pools worth of blood and gore start pouring out of my arm :|. Anyhow, aside from that, so far so good! Left pic is from about a week ago, and right side is today. Next is a side by side comparison of my stomach scar. The pic on the left is from a little more than a week ago, and the one on the right is from today. 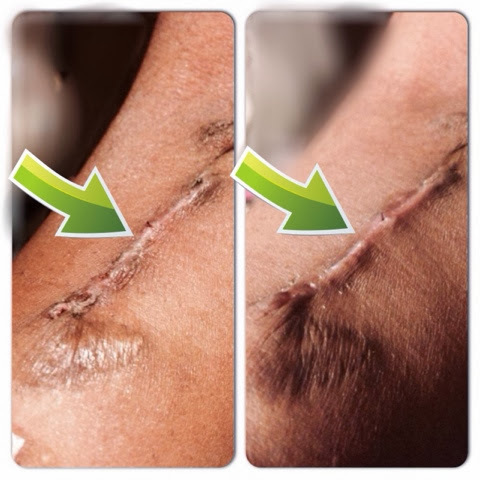 The arrows show the same spot/section of the scar so you can see the healing progress, as I cannot take the exact same pic every time. It’s looking good! After this post, I’ll put a fresh silicone strip for the week back on. I know the left pic especially from last week isn’t the best quality-I’ll try better next update. That’s it for now. Time to silicone strip up!